The US Campaign to End the Israeli Occupation is proud to endorse the upcoming New York Session of the Russell Tribunal on Palestine, October 5-7. This is the fourth international session of the Russell Tribunal. During its 2010 London Session, I was privileged to testify at the tribunal about U.S. governmental complicity in providing the Israeli military with Caterpillar bulldozers. You can watch my testimony by clicking here or on the picture to the left. 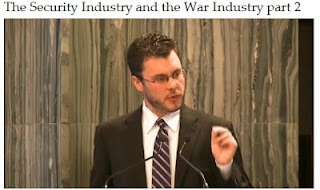 Check out the third video "The Security Industry and the War Industry Part 2" beginning at 41:00. But watch as many of the videos as you can. All the testimonies were such powerful statements about corporate complicity in Israel's human rights abuses of Palestinians. Given that the New York Session is devoted to the "complicity of the United States of America and the United Nations in Israel’s occupation and violations of Palestinian rights," it is natural that we would get behind this important effort. Of course, the UN is culpable for permitting Israel's human rights abuses to continue because in large measure it is our government's diplomatic protection of Israel at the UN which prevents it from taking more effective action. The Russell Tribunal on Palestine (RToP) will be holding its fourth international session in New York City on 6 & 7 October 2012. In addition, there will be a kick-off event on 5 October 2012. The RToP is an International People's Tribunal created in response to the international community's inaction regarding Israel's recognized violations of international law. The Tribunal aims to bring attention to the complicity and responsibility of various national, international and corporate actors in the ongoing Israeli occupation of Palestinian territories and the perpetuation of Israel's impunity under international law. Although the RToP has no legal status, like other Russell Tribunals on Vietnam, Chile and Iraq, its legitimacy comes from its universality and the strength that it draws from the will of citizens and the support of international personalities who advocate for an end to the Israeli occupation and Israel's denial of Palestinian rights. For more information on the Tribunal, please see: http://www.russelltribunalonpalestine.com/en/. The New York session of the RToP will focus on the complicity of the United States of America and the United Nations in Israel’s occupation and violations of Palestinian rights. As with previous sessions, the 2012 New York session will see dozens of experts and witnesses present their testimonies to a jury of international personalities who will deliberate on the proceedings. The jury will then issue their conclusions publicly and bring them to the attention of the relevant international actors. The previous three session of the RToP focused on the complicity and responsibility of the European Union and international corporations in Israel's violations of international law, as well as on the question of whether Israeli practices towards the Palestinian people violate the prohibition on apartheid.